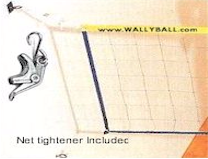 Regulation Wallyball net has black nylon netting with gold trim. The top tape has the Wallyball.com logo across it. Net tightener included. Top Strip: Gold 14 oz. vinyl with the Wallyball.com logo across it.